In 1978 and 1979, former Akron, Ohio childhood star Rachel Sweet had a quick flash of musical stardom driven by the marketing genius of London’s Stiff Records. She started off strong riding the crest of the New Wave scene with her delightful blend of pop and country. Later in the 80s, she saw a few other brief moments of light before she let the sun set on the music biz moving on to a successful career in television production. I first saw her on the Be Stiff tour at New York’s Bottom Line in 1978 when she was backed by those brilliant power poppers from England, The Records. 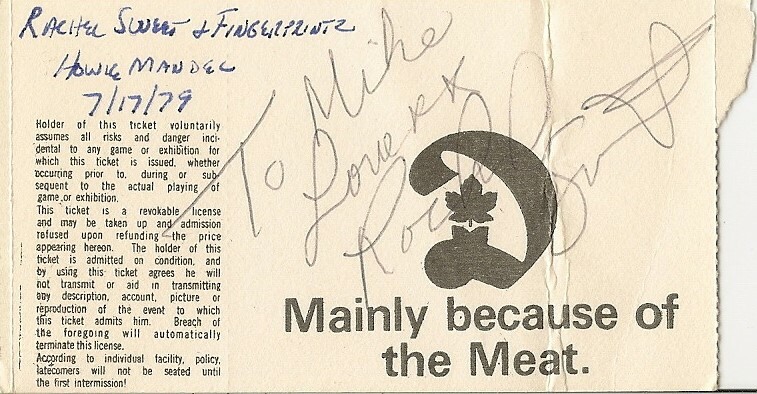 For this 1979 follow-up tour of North America, her backing band was Scottish rockers Fingerprintz. My job at the time caused me to spend a chunk of time in the great city of Toronto, a town I dearly miss. 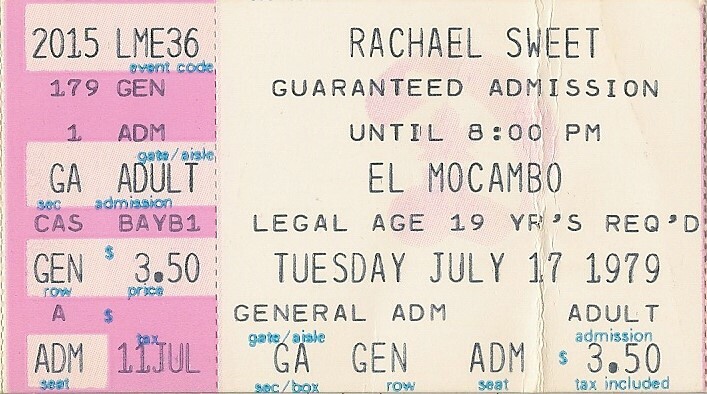 While there I caught a handful of live music and was quite thrilled to see Sweet at El Mocambo, then a high-profile night club. In 1978, Elvis Costello & the Attractions released a live promo disc recorded there. The year before, The Rolling Stones cut some live tracks at El Mocambo while in town creating a stir with the Prime Minister’s wife. I recall El Mocambo having a comfy music room upstairs. On this night, Sweet and Fingerprintz sounded great. Her live set that night included her cover of Costello’s “Alison.” Back then, Sweet and I shared a common love for the music Costello and Bruce Springsteen. She just talked about The Boss, however, never tackling one of his songs. After the show, I worked my way back stage and got Sweet to sign the back of my ticket. If you look at my handwriting on the stub pictured below, you will see that the opening act was an up-and-coming young Canadian comedian named Howie Mandel. He, like Sweet, would also later find great success through television.